I'm now doing my second run of the sound of music as a single trombone in the orchestra. It is scored for two, plus the tuba. There really isn't much of any interest in the tuba book, but here are the numbers where I've been playing second instead of first. 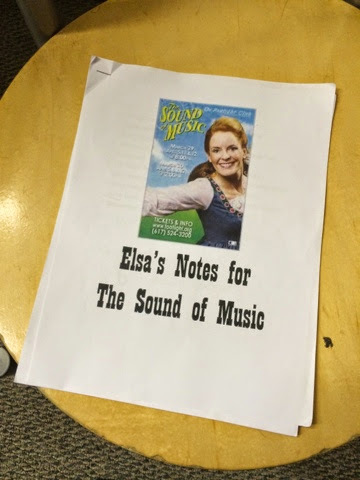 For Elsa's second go at Gretl (Footlight Club this time), I made up a little notebook for her to keep track of the notes given by the choreographer, director, and music director after each rehearsal. I had a page for every number and act that she was in. I started with some notes that I already had for her, and some from the directors. Then, after each rehearsal, we took any additional notes and wrote them in by hand. Then, we reviewed them before each subsequent rehearsal and performance! Organizing the notes this way made it much easier to review scene by scene and number by number, and it made a big difference!